Suzi Homemaker Review & Giveaway! I want to introduce you to the Suzi Homemaker Custom Embroidery website! It is a mom-owned custom embroidery and sewing business. Suzi has a wide variety of gifts and items for the entire family. Whether you are looking for something as a gift or for yourself, she has so many to choose from! Suzi Homemaker Custom Embroidery features and entire line of apparel that can be embroidered with logos or designs. There are many styles to chose from, and there are items for adults all the way through infants. This website has so many great gifts. Some of my favorite products are the great patterened bags they carry that can be monogrammed with your initials. I love the train cases. Check out this one is the New Dot pattern. I also love the laptop bags. My favorite is the Paris print. As the mom of four, I love the babies & children section of the website. There are great lunchboxes, bookbags, and items like aprons and big brother/sister shirts. My favorite was the traveler, a personalized toiletry bag for your child. I ordered the red pirate version for Seth, as he is spending three different weeks at two different summer camps this month. As Seth is now nine, he is bringing more and more personal care items with him, although I did convince him that bringing AXE spray into the woods for camping in a tent would only tempt the bugs. That being said, he needed something to carry his items to and from the bathroom for showers and such. So the red pirate bag it was, and Suzi was kind enough to embroider his name on the side in a black thread using a pirate font. I doubt anyone else at camp will have this cool bag, but even if they do the lettering makes it easily identifiable as his. So this is how it came out. And these are all of the things we had to fit inside. I was worried when I ordered the bag how much it would really hold. It’s a little difficult to get a shot of the inside of the bag, but I tried. Because I want you to see that this bag isn’t even half full! Seth totally loves his bag. Not to “cutesy” for my boy who is growing up so fast. It’s a great size, and the handle makes it easy for him to carry around with his fingers while his arms are preoccupied with the clothes and towels and such. We are very, very happy with this product! Suzi was gracious enough to sponsor a giveaway for us! So even if your not into the Traveler bag, you can choose what you do like because one Momma D and Da Boyz reader will win a $25 virtual gift certificate to be used on the item of your choice from Suzi Homemaker Custom Embroidery! To enter the Suzi Homemaker Custom Embroidery giveaway, please visit their website. Pick your what item most interests you and then come back here and leave a comment telling me what that item you would like and why. YOU MUST DO THIS FIRST OR OTHER ENTRIES WILL NOT COUNT. Please be sure that your profile has your email right on it, or be sure to leave your email address in your comment. This giveaway is open to US residents only. The Suzi Homemaker Giveaway will close at 11:59 pm on July 23rd. Super Cute Site! I'm in need of a little traveler bag myself…perhaps the Chocolate Giraffe will suit me??? Yes, I think it will. I love the Market Totes! They would be so nice for carrying things back and forth to the car! I love the diva tote in black. 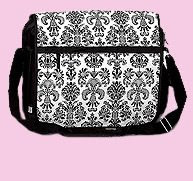 Being as I am going to a brand new college this coming fall that really cool laptop case would be perfect,(plus its new paltz which is known for its artsyness, but this would prove that science people can be fashionable as well). And I almost forgot that I am a follower as well! my favorite is the chocolate bloom traveler. pink and brown and flowers! perfect!!! I like the diva tote bags. Pink and black both. I love the computer case in the Paris design! I really need a case for my laptop. I added your Facebook page. My name is Sophie Escandor. I really thought the Toothfairy pillows were adorable, and definately handy now that my kids are losing their teeth like wildfire. I do follow you on twitter, so enter me again!